Molly Patricia Schaus was born July 29, 1988 in Voorhees. The Schauses moved to Minneapolis when she was a girl, and learned to skate on a pond in the backyard. In 1995, the family moved again, to the Chicago bedroom community of Naperville. That is where Molly stopped figure skating and began playing hockey, becoming one of the area’s top goalies in her teen years thanks to her older brothers, who used her for target practice. She was further inspired by the U.S. Women’s team, which won a gold medal at Nagano in 1998, It was in Naperville that she also started a friendship with Cammi Granato, star of Team USA. The Schauses moved again, to Natick, MA, when Molly was a 10th grader. She played goalie for Deerfield Academy (where she was team MVP twice) and the Assabet Valley Under-19 club, winning five separate state championships. She also had two third-pace finishes and a runner-up in the USA Hockey Girls national championships. Not surprisingly, Molly was recruited to play for Boston College—by Granato’s former teammate, Katie King. She led BC to its first-ever Frozen Four appearance as a freshman in 2006–07. As a junior, Molly was a finalist for the Kazmaier Award and was a second-team All-American. She was named top goaltender in three Beanpot Tournaments during her four varsity seasons. In her senior year, Molly was 24--5-4 and earned first-team All-America honors. During her college career, she also played for two gold medal-winning U.S. teams in the Word Championships. 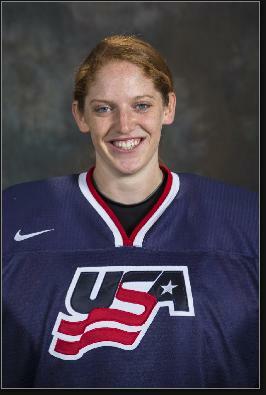 Molly was a member of silver-medal Team USA at the 2010 Olympics, seeing ice time behind starter Jessie Vetter. At the Four Nations Tournament in 2010, she was spectacular in turning back 49 of 52 shots during a 3–2 OT loss to Canada in the gold medal game. One year later, Molly shut out the Canadians 4–0 in the first 12 Nations Tournament. In 2011, Molly was the #2 pick in the Canadian Women’s Hockey League draft, by the Boston Blades. That fall she also began her coaching career as the goalies coach for UMass-Boston.